Baboon FlowerCormous perennial. Ribbed, blade-shaped leaves grow winter through spring when spikes o..
False IndigoDeciduous perennial. Vivid green leaves grow on upright arching green branches. 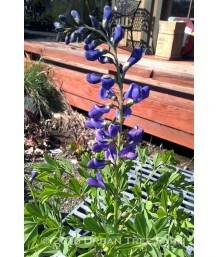 Long spi..
Blue False IndigoDeciduous perennial. Three-part leaf covers stems of this pea-family plant. Erect a..
Shrub BegoniaEvergreen perennial. Frost tender. Elongated, dark green leaves are red underneath. Thi..
Miniature Mat DaisyEvergreen perennial. 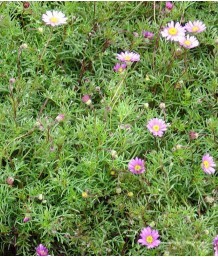 Used as groundcover. Tiny green leaves grow into a flat carp..
Bergenia/SaxifrageEvergreen perennial. 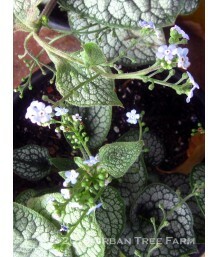 Shiny green leaves form dense clumps; nodding white flowers a..
Silverlight BergeniaEvergreen perennial. Shiny green leaves with red margins form dense clumps; nodd..
Heartleaf BergeniaEvergreen perennial. Shiny green leaves with red margins form dense clumps; noddin..
Chinese BergeniaEvergreen perennial. 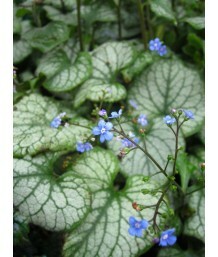 Shiny green leaves form dense clumps; nodding white flowers are..
Heartleaf BergeniaEvergreen perennial. Large fleshy green leaves take on red tones in colder months,..
Trunking BeschorneriaEvergreen perennial. Rare; the only beschorneria that forms a trunk. 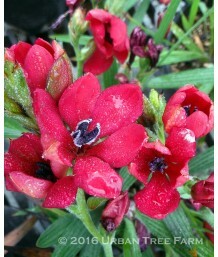 Stunning s..
False Red YuccaEvergreen perennial. Stunning grey-green strappy leaves grow into attractive large r..
False Red YuccaEvergreen perennial. Green sandpaper-textured succulent leaves with a central yellow ..
BidensEvergreen perennial. Low growing mat of lacy foliage bears bright golden yellow daisy-shape fl..
Outback Jumbo DaisyEvergreen perennial. Shiny green foliage is topped by prolific display of daisy s..
Swan River DaisyEvergreen perennial. Green ferny foliage is topped by prolific display of dainty, bl..
Swan River DaisyEvergreen perennial. Green ferny foliage is topped by prolific display of dainty, de..
Swan River DaisyEvergreen perennial. Green ferny foliage is topped by prolific display of dainty, wh..
Siberian BuglossDeciduous perennial. Large heart-shaped, deep green leaves form compact clump, beari..
Variegated Siberian BuglossDeciduous perennial. Large heart-shaped, grey-green leaves with creamy ma..
BrunneraDeciduous perennial. Large heart-shaped, silver and green leaves form compact clump, bearing..
Variegated Siberian BuglossDeciduous perennial. 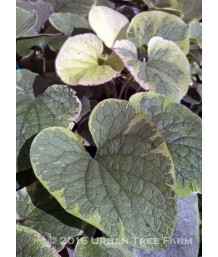 Large heart-shaped, silver leaves with green veins f..
BrunneraDeciduous perennial. Large heart-shaped silver leaves with attractive green veins grow into ..
Variegated BrunneraDeciduous perennial. Large heart-shaped, green leaves have bold cream edges and f..
BulbineSucculent perennial. Branching stems of slender, fleshy, bright green pencil shaped stalks pr..